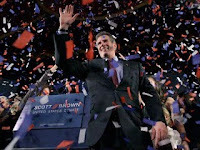 Kudlow's Money Politic$: Are Republicans Listening to the Scott Brown Message? Are Republicans Listening to the Scott Brown Message? Sen. Scott Brown’s epic victory in Massachusetts on Tuesday night dealt a crushing blow to Obamacare, cap-and-trade, card check (and other union favors), and most importantly, all the tax hikes that are lingering on the table. But does Washington really understand the Scott Brown message? President Obama thinks his “remoteness and detachment” are the problems. This is nonsense. Obama’s tax hikes and spending explosion are what caused the populist tea-party revolt that was punctuated by Scott Brown’s extraordinary victory. And that leads to the next question. Are the Republicans listening? Do they really understand why Scott Brown was victorious? If they do, why aren’t members of the Republican leadership loudly campaigning for an end to tax hikes, just like Scott Brown? The cornucopia of tax hikes currently on the table includes higher levies on capital-gains, top earners, dividends, investment (via the payroll tax), carbon, millionaires, banks, stock transactions, and estates (via the death tax). It’s a long Democratic wish list of anti-growth policies, and Scott Brown’s triumph should signal the end of it. But it won’t happen unless GOP congressional leaders make a big deal about it. For example, some Blue Dog Democrats want to extend the Bush tax cuts, rather than letting them expire next year. Republican leaders should be making a big deal about this. They need to get it front and center, making expiration a condition to any new legislation. This [health care] bill is not being debated openly and fairly. It will raise taxes, it will hurt Medicare, it will destroy jobs and run our nation deeper into debt . . . I will work in the Senate to put the government back on the side of people who create jobs and the millions of people who need jobs. And remember, as President John F. Kennedy stated, that starts with across-the-board tax cuts for businesses and families to create jobs, put more money in people’s pockets, and stimulate the economy. It’s that simple. There you have it. Scott Brown could not have been any clearer. That’s the great thing about his message -- its breathtaking clarity. Across-the-board tax cuts and a revival of free-market capitalism on the supply-side. And recall that when President Obama mocked Scott Brown for driving a pickup truck, Brown quickly responded that unfortunately, in this economy, not everyone can buy a pickup. “My goal is to change that,” he said on the eve of the election, “by cutting spending, lowering taxes, and letting people keep more of their own money.” Right on message. And during that campaign, Brown argued that health-care reform is a tax hike and that cap-and-trade is a tax hike. This should become the Republican message, too. It’s about taxes, as well as spending. A recent Washington Post poll showed that by 58 to 38 percent, voters want smaller government and fewer government services. This, too, should be the Republican congressional message. It is, in fact, an economic-growth message, the likes of which we haven’t heard since Jack Kemp promoted it in the late 1970s. And the brilliance of Scott Brown was to use the JFK tax cuts -- an across-the-board reduction in marginal tax rates -- to attract Democrats and independents to his message. An across-the-board tax cut is the fairest pro-growth message of them all. Lower tax rates for everybody. Get out of the box of rich people and class warfare. For the Ted Kennedy Democrats, that box has been a loser for decades. But for timid Republicans always on the defensive, now is the time to break out and adopt the Scott Brown theme. This is what Reagan did. This is why the Gipper touted JFK’s across-the-board tax cuts. Republicans must now be bold and fight for across-the-board tax relief, for families, individuals, and businesses, along with smaller government, fewer services, and across-the-board spending cuts. While Team Obama is fighting for more government employment, with trillions of dollars of spending, it is time for Republicans to fight for private free-enterprise employment by letting folks keep more of what they earn and by providing new incentives for the extra hour worked and the extra investment dollar put at risk. This is where the GOP must go. Republicans should not let another day pass without unleashing a fusillade of new tax-cutting proposals to get America moving again.